This is turning out to be one of the worst springs ever for Americans who suffer from allergies. But for those who'd prefer to avoid drugs in seeking relief from their sniffles, itchy eyes and other symptoms, Dr. Vincent Pedre had some suggestions on "The Early Show" Friday. The theory behind honey is that if you eat local honey from bees that live in your area, the nectar created by the flowers that they draw from has pollen grains in it that are local to your area. Taking a spoonful of this about one month before spring starts is almost like a natural form of homeopathy, in which you're being exposed to tiny amounts of the allergen, which helps you become resistant to it. New York City recently approved beekeeping, and one brand, called Hi-Rise Hive, is sold at local health food stores. The theory hasn't been proven by a double blind study yet, but as long as you don't give honey to a child under a year old, it's a safe remedy and it won't do any harm to try it. Vitamin C taken with Quercetin works in unison to stabilize mast cells. Mast cells are tiny cells that line your nasal passages and go down into your lungs. Basically, when a mast cell is exposed to a pollen grain that you're sensitive to, it releases histamine and causes the symptoms typical to allergies. By stabilizing the mast cell, you reduce its activity so it doesn't release histamine as easily as it would have. You can take Vitamin C and Quercetin several times a day when you find you're having symptoms, since you can't overdose on either, because they're water soluble, and any amount that you don't digest will be released in your urine. Vitamin C and Quercetin are sold as a combo at health food stores. If you've ever come in contact with this perennial, you probably remember the sting. It has an acid at the edge of pointy leaves, and the acid stays on your skin. But, it's safe and healthy in drink form. Steep the tea for 10 to 15 minutes to obtain the full benefits of the medicinal oils. The oil from the leaves has an antihistamine effect and tends to dry up the mucous membranes. If you inhale steam with certain essential oils, you can breathe easily -- quickly. Bring water to a boil in a saucepan, turn off the heat and add 4 drops of eucalyptus oil, 1 to 2 drops of tea tree oil and three drops of rosemary essential oil. The eucalyptus oil opens up your airway. The tee tree oil has antimicrobial properties that align with the rosemary. The effect won't last for several hours, but it can provide immediate relief. It can be effective for this purpose. Acupuncture works by putting a needle into what is called an acupuncture point, a pressure point. By pointing the needle there, it creates signaling to your nervous system to alter what's happening in your body at the moment. Endorphins are released, local anti-inflammatories are released, and it can reduce inflammation. The type of medicine I practice realizes that, while your body reacts to external allergens, the underlying cause may be certain foods that can increase your level of reaction. So, my first piece of advice is to begin with a non-allergenic diet. For example, for a lot of people, dairy causes them to create more mucous. If you're having dairy on a regular basis, and it's spring and you're a person who's already sensitized to pollen, you're more likely to develop mucous buildup and congestion in your sinuses that can lead to a sinus infection. The same thing goes for sugar. It can increase mucous production and inhibits white cell activity. Wheat is another thing to which 10 percent of Americans are sensitive and don't even know it because it doesn't have a sudden onset. Rather, it's a gradual reaction. The only way to know if you're allergic is to take wheat out of your diet and see how you feel in two or three weeks. Some of my patients report a general sense of well-being and more energy. A lot of women report constipation goes away after they remove wheat from the diet. This treatment is the most powerful one on the list, because it's for treating the underlying cause of allergies. The remaining remedies are for treating symptoms. The thing to bear in mind is that there's no instant gratification with this, since it can take several weeks before you see results. Neti pots have been used since ancient times in India to clear nasal passages. 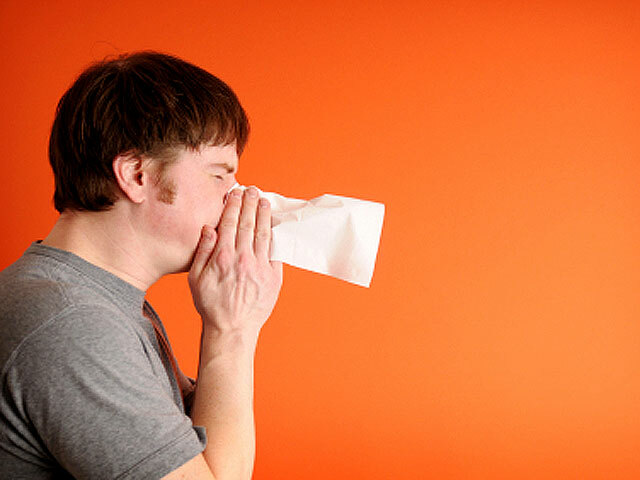 Using one, or a saline nasal rinse such as Sinucleanse, is a great way to help reduce allergy symptoms. You use a salt solution that, at room temperature, is bactiostatic (antibacterial). When you're leaning forward and putting the neti pot in one nostril and tipping over, it runs through your nasal passage and out the other nostril, washing out any pollen grains that are stuck to your mucous membranes. You're reducing your exposure and reducing the activity of your mast cells and your immune system. It also helps with congestion and with mucous buildup.